While reviewing the stats of my different domains, I got a fantastic surprise! I have been writing for years about Business Process Management on the M2MSys blog and it is very rewarding that, for a moment in time, Google's search algorithm considers that one of my blog entries deserves to be #1.... NICE!!!! Since I know that this situation will soon change, as other business process management experts, write about BPM books, I decided to do a screen capture, for future bragging rights. Among 1,530,000 index articles by Google, on the words "BPM BOOKS", the blog entry I wrote was #1.
Business Process Management is a discipline that is starting to grow very rapidly. It's no longer the domain of a few early adopters. It's slowly maturing into the next hot thing... even thought it has been like that for a while. 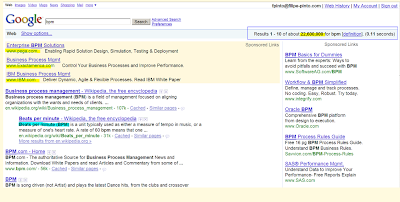 A quick search on the word "BPM" on Google, gives you immediately a perspective of how competitive the BPM market is. Unfortunately "BPM" is a word with many meanings. Google hasn't yet refined its search engine to determine that I'm not looking for the acronym "Beats Per Minute", or even looking for a band called "BPM". What is most amazing is that BPM is also a dutch acronym for a disease. The RollsRoyce of BPM searches is actually the words "business process management". See the difference for yourself. From 22.6 million index pages on BPM, this last search on "Business Process Management" actually returns 135 million. Pretty amazing! That's because Google personalizes search results according to your search history. They logically found tight correlations between your search history and your blog. Try logging out from Google to see the actual rankings.